Mary Louise Gerek has been involved in needle arts as long as she can remember. Her grandmother taught her to sew and she continued to enjoy needle arts for the next 35 years. We had a chance to chat with Mary Louise about what inspires her, what her best tips for other quilters are and her life outside quilt design. Read on for our feature on Mary Louise Gerek Designs. 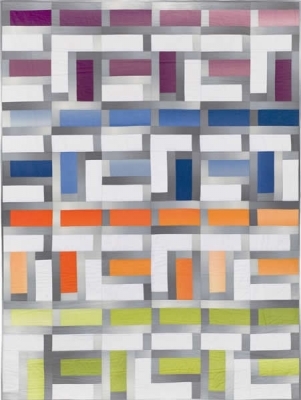 QW.com: What inspires your art quilt patterns? MLG: I really have dueling passions in quilting; art quilting and designing patterns. I started quilting after a trip to New Mexico and realized that it is all about the fabric. My art quilts are inspired by nature, music and poetry. I have a couple inspired by Grand Prismatic Hot Springs in Yellowstone National Park. Two were inspired by the poetry of Kitty Jospé of Rochester, NY. She even chose them to be on the covers of her two books, Mosaicq and Gathering Lines. My first art quilt was inspired by the music at the Rochester International Jazz Festival. Listening to the music, I could almost see the notes as they rose into the starry night. 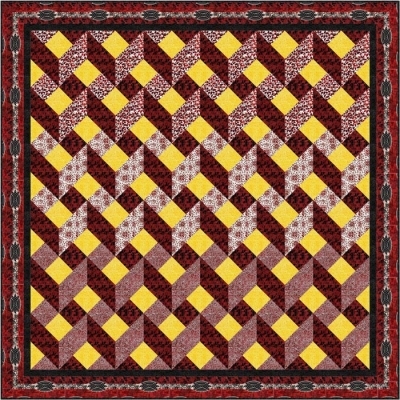 For my quilt patterns, I love to see how secondary patterns appear when identical blocks are rotated and mirrored. This is really evident in Blue Angles and Seashell. The most interesting patterns emerge from non-symmetrical blocks, which make the patterns look complex. However, I try very hard to have all straight line piecing in my blocks, making construction easier than it looks. The major challenge is ensuring the patches and blocks are constructed in the proper order. MLG: It is amazing what you can do in 10 to 30 minutes. If you have a project going, have it organized and ready to sew. When you find a few minutes between other activities, try a little chain piecing; or put a few blocks together. Your work will come together more quickly than you thought. Another way to gain sewing time is to make an appointment with yourself. Put dedicated sewing time in your calendar each week – and do not schedule over it. This time should have as high a priority as any other appointment. After all, it is an appointment with you to take care of yourself. QW.com: You are an expert on Electric Quilt 7 software. Can you tell us more about how it plays a big role in your designs and teaching career? 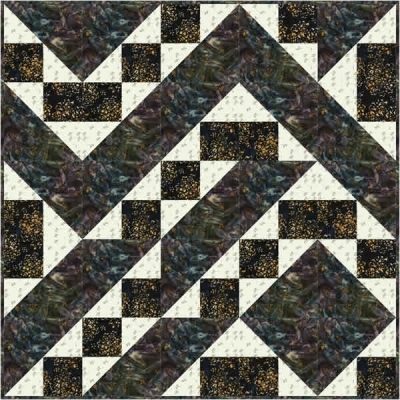 MLG: Electric Quilt 7 is my major planning and designing tool. 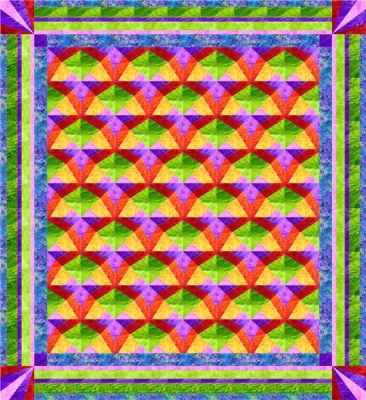 I have designed many more quilts than I will every make as I explore ideas and color combinations. I can start with a few lines and create my own block, or extract a unit from a block that comes with the program. EQ allows the drawings to keep up with my thought process. It also allows me to change size of a project very easily, or engineer the patches to eliminate Y seams. I enjoy teaching EQ because I see the creative process take hold as students master the tools. I will be teaching a new class “Digging Deeper into EQ7” at The Sewing Circle in Fort Collins, CO starting February 5, 2015. Please visit their web site for details. QW.com: So many of us learned to quilt and sew from our family members. What are some of the most valuable lessons you learned from yours? MLG: I learned to knit from my grandmother, Louise Connell Robert. Along with my name, it created a closeness to her that I still treasure, even though we lost her when I was in college. My brother Shelby, started me in needlepoint after he picked it up from his wife. They both taught me the value of creating my own work and giving gifts from my own hands. I enjoy the tactile part of these activities; the feel of the yarn or fiber, and of course working with the colors. Quilting has allowed me to create pieces that are completed on a shorter time frame. It has also allowed me to work more with color and contrasting textures. MLG: My husband and I enjoy traveling both locally and internationally. Many of the pictures I take are for texture and interesting color/lighting on objects for quilting ideas. We also visit museums and natural areas which definitely adds to my inspiration. Since we moved out west, we take walks in the foothills of the Rockies. But, when trapped inside, I love reading and cooking. MLG: If you find your tools moving from place to place as you work, you may want to create a basic tool set to have at each workstation. For example, I have small snips, ruler or measuring tape, pins, tweezers and large scissors at my sewing machine, ironing board, cutting table and serger table. There is a little extra expense, but having the tools where and when you need them really aids in productivity. I really like to starch my fabric when I am piecing – especially patches cut on the bias. The added stiffness aids in accuracy and decreases distortion of the patches. You can starch each piece, or treat the fabric prior to cutting. There are many products you can use depending on the desired stiffness. Spray sizing and commercial spray starch have perfumes that may bother some folks. Your quilt store should have Best Press starch alternative. If using commercial spray starch, be sure to wash it out when the quilt is finished. Some bugs find starch great for lunch. We hope you enjoyed our feature. 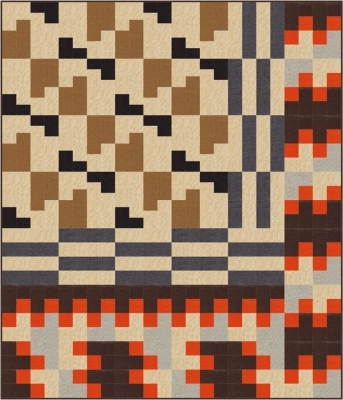 Visit our website to find out more about Mary Louise Gerek’s patterns. Don’t miss any of our blog posts containing great tips for finding more time to do what you love! Sign up for our mailing list. This entry was posted in Designers, QuiltWoman and tagged Mary Louis Gerek Designs, QuiltWoman.com. Bookmark the permalink.